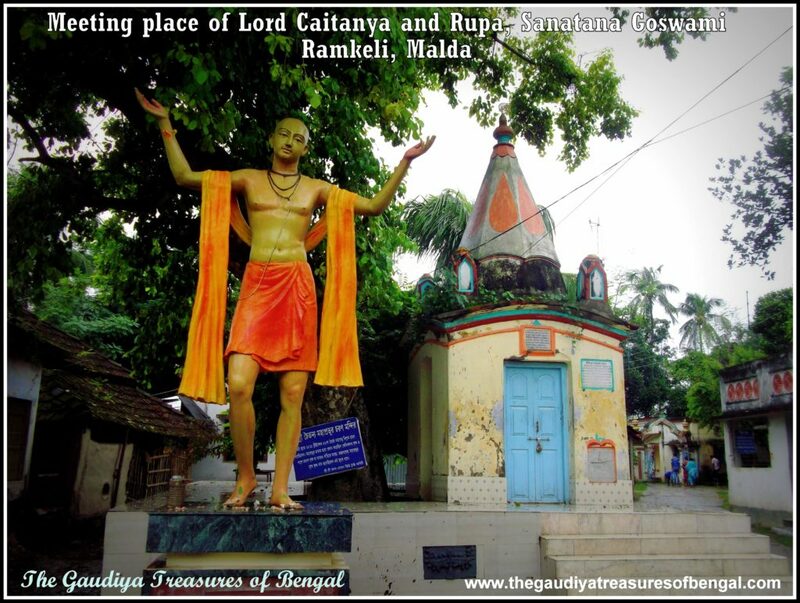 Ramkeli, situated in the town of Malda, has been the erstwhile headquarters of Sri Rupa and Sanatana Goswami before they fully surrendered themselves unto the lotus feet of Sri Caitanya Mahaprabhu (refer – ‘YogPeeth, Mayapur, Navadvipa – The birthplace of Sri Caitanya Mahaprabhu’). It was here at Ramkeli, that Lord Caitanya had rested while He was en route to Vrindavana. 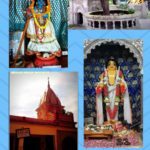 Mahaprabhu did not travel as far as Vrindavana, though, and returned back only from Kanai Natshala (a place hardly 100 Kms from Ramkeli). The only purpose of His coming to Ramkeli, however, was to bless and unite with His eternal servants Sri Rupa and Sanatana Goswami. The tamal tree under which Lord Caitanya is said to have meditated is still preserved here at Ramkeli. A small temple built under this tree enshrines Sri Gaurahari’s lotus footprints on stone. There are eight sacred ponds surrounding the temple. These ponds (Kunda), dedicated to the eight principal Gopis of Vrindavana, were dug by Sri Rupa and Sanatana themselves when they lived here. 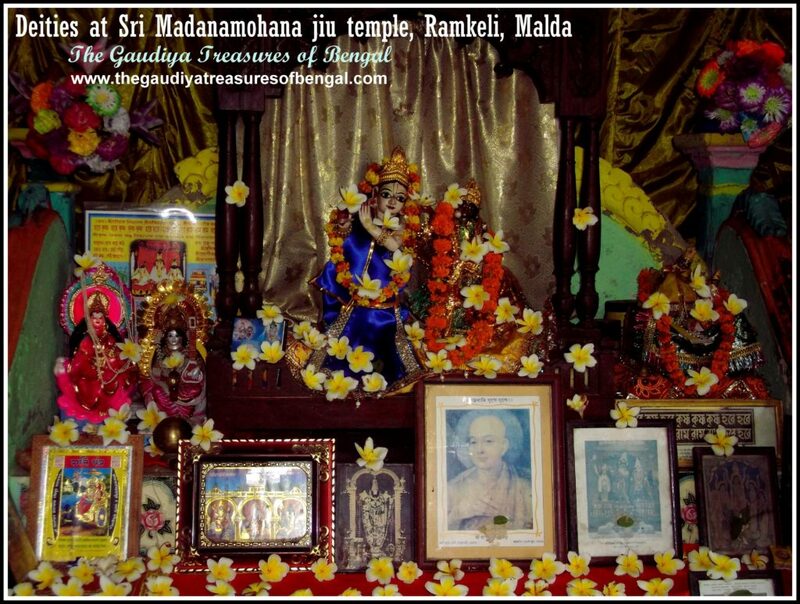 ‘the Gaudiya treasures of Bengal’ considers itself greatly fortunate to have been able to enter and serve this cintamani (wish-fulfilling) dham. We seek blessings and compassion of the Vaishnavas, before attempting to write a few lines in glorification of Sri Rupa and Sanatana Goswami. 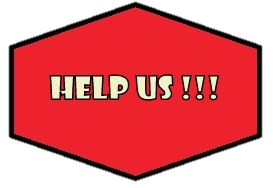 The readers are requested to kindly excuse any of our unintentional mistakes, as we are mere fools, who, not knowing our limits, are trying to delve deep into this esoteric well, to excavate the mesmerizing jewels that adorn the devotees of Sri Gaurasundara. Sri Jiva Goswami has explained the genealogical history of Sri Rupa Goswami’s family. They were the descendants of Sarvagya Jagadguru, a great scholar of the Vedas. He was an expert in Yajurveda. Sri Sarvagya was a brahmin and also one of the kings of Karnataka in the 12th-century sakabda era. In his lineage appeared a great devotee named Kumar Deva who had settled in Jessore (Bangladesh). He got married to a very chaste lady named Revati Devi. In the course of time, Kumar deva and Revati Devi gave birth to many sons. Most illustrious among them were Amara (came to be later known as Sanatana Goswami), Santosh(came to be later known as Rupa Goswami) and Vallabha (came to be later known as Anupama). It is believed that Sri Sanatana was born around 1488 AD while his younger brother Rupa, appeared in this world around 1493 AD. Srila Krishnadasa Kaviraja Goswami mentions in the Adi Lila of his Caitanya Caritamrta, that Sri Rupa, Sanatana, and Anupama are the 43rd,44th and 45th branches of Mahaprabhu’s desire tree of devotional service and that they are the best of all (Anupama vallabha, Sri Rupa, Sanatana, ei tina Sakha vrikshera paschime sarvottama). Sri Kavi Karnapura reveals in Gaura Ganoddesha Dipika that Sri Rupa Goswami was none other than the incarnation of Sri Rupa Manjari, one of the chief assistants of Lalita Sakhi (one of the eight principal Gopis of Vrindavana). Sri Sanatana Goswami was the combined incarnation of Rati Manjari, Lavanga Manjari, and Sanatana Kumara. Jiva Goswami, the son of Anupama, was the incarnation of Vilasa Manjari. After Kumar deva had passed away, these three brothers, came over and settled here at Malda, where they continued with their studies. As they grew up they became exceptionally attractive to all of society. They possessed beautiful bodily features, noble character and natural compassion towards every living being. They were embodiments of the Lord’s love. These three brothers studied the science of logic (Nyaya) from Madhusudana Vidyavachaspati, who was the brother of Sarvabhauma Bhattacharya. They also became proficient in Sanskrit, Arabic, and Persian. When Sanatana Goswami was very young, he saw a dream in which a brahmin gave him a copy of Srimad Bhagavatam. The next day, to his surprise, he indeed received Srimad Bhagavatam from the same Brahmin he had dreamt of the other day. From then on, Sri Sanatana began scrutinizingly studying Srimad Bhagavatam leaving aside all scriptures. Bengal, during that time, was under the Mughal rule of Nawab Hussain Shah. He is the same king who had employed Sri Mukunda Das of Srikhanda as his personal doctor (refer – ‘The Great Vaishnavas of Srikhanda’). Seeing the popularity of Sri Rupa and Sanatana amongst the general populace, the Nawab decided to employ them as his ministers. In this way, he planned to bring the entire Hindu population under his control. If Rupa and Sanatana joined him, then his subjects would become more submissive, he thought. On the other hand, he notified Sri Rupa and Sanatana telling them that if they became his ministers, he would award the Vaishnavas and the Hindus with all freedom. Instead, if they did not accept his proposal, then he would torture and persecute the masses. Hearing the king’s warning, Sri Rupa, Sanatana and Anupama reluctantly agreed to serve the king. Their service was so exemplary that Sri Sanatana Goswami was made the Prime Minister of Bengal and Sri Rupa was made the Home Minister. Due to their close proximity with the Muslims, the two brothers were excommunicated from the Hindu society by the orthodox caste brahmanas of Gaur (Malda – the erstwhile capital of Bengal). Thus Sri Rupa Goswami came to be known as Dabir Khaas and Sri Sanatana as Sakara Mallick. The king grew very fond of them and considered them his own brothers. He awarded them with tremendous amounts of wealth and power. They settled down here at Ramkeli, in Malda, where they constructed beautiful opulent palaces and gardens that served as a replica of Vrindavana. Being pure devotees, Rupa and Sanatana always lived in the mood of separation from the Lord and His eternal abode. Here at Ramkeli, the beautiful temple and the ponds dug by our Goswamis are still present. 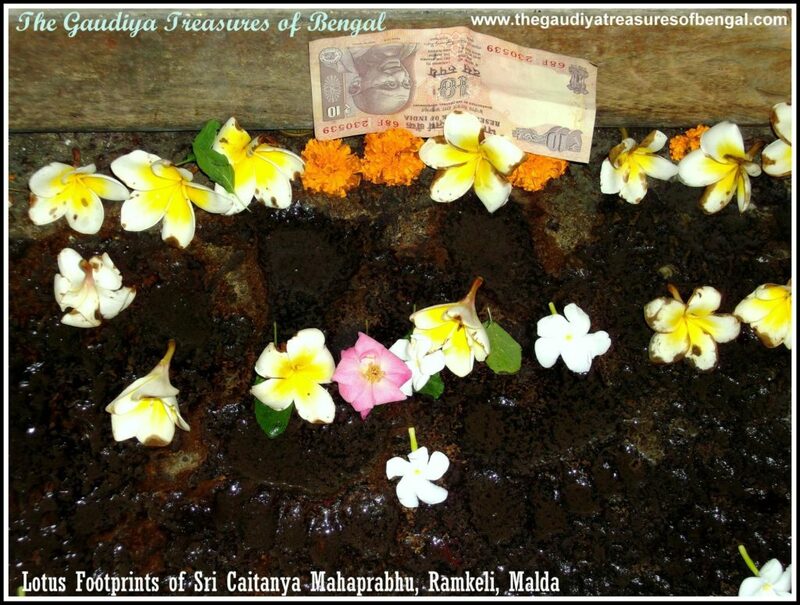 ‘the Gaudiya treasures of Bengal’ considers itself exceedingly fortunate to have been able to take their darsana. The beautiful deity of Sri Madana Mohana that was installed by them over here continues to accept our humble services till this day. They held the highest posts in the government and were very rich. Yet, they did not possess even a grain of pride. People, scholars, Vaishnavas from all parts of the country would come to meet them and they would worship them with the most intimate hospitality. Their humility and simplicity captured people’s hearts. There is a beautiful piece of architecture that we came across while visiting Gaur. This marvelous victory tower, known as Firoz Minar, is more than 26 meters in height. According to the reliable sources, this tower was engineered by Sri Sanatana Goswami, while he served the government. Lord Caitanya, during His second attempt to reach Vrindavana, decided to take a roundabout route. Actually His desire was not traveling to Vrindavana, but instead, He wanted to meet and shower His mercy upon Sri Rupa and Sanatana. Thousands of men accompanied the Lord during His journey. All of them were surcharged with deep ecstatic feelings. Completely devoid of external consciousness and surrendering themselves completely, they sang and danced along. An ocean of Love which flooded the people with waves after waves of ecstasy. As the procession reached new places, more people joined in. Wherever the Lord touched the ground with His lotus feet, people immediately gathered to take the dust. The people took out so much dirt that holes were created in the ground. Just by seeing the smiling face of the Lord, all their lamentation and unhappiness became vanquished. Eventually, the Lord arrived at Ramkeli, where innumerable people arrived to take His darsana. Performing sankirtana over here, the Lord danced and sometimes lost His consciousness out of an intense love of God (tahan nritya Kare Prabhu preme achetana). When Nawab Hussain Shah came to know that Lord Caitanya was attracting so much attention, he became astonished. His spies informed him how Mahaprabhu had immersed everyone in a wave of transcendental ecstasy. 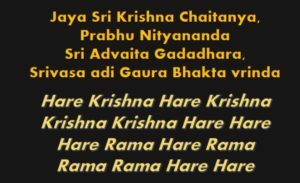 He learned how the people irrespective of their caste, creed or religion were raising their hands and engaging in the congregational chanting of Hare Krishna Hare Krishna Krishna Krishna Hare Hare, Hare Rama Hare Rama Rama Rama Hare Hare. So the Nawab then asked Keshava Chatri, whether he knew anything about Lord Caitanya. Keshava, in spite of knowing everything, tried to diplomatically downplay the situation. He replied that Caitanya deva was simply a touring mendicant and that only a few people had come to see Him. He warned the king against considering the advice of his Muslim informers too seriously. After pacifying the king in this way, Keshava sent a brahmana messenger to Lord Caitanya requesting Him to leave without delay. The King then enquired from Rupa Goswami (Dabir Khaas) and asked for his opinion. Rupa Goswami glorified Sri Caitanya and revealed that He was none other than the Supreme Personality of Godhead Himself. He added that it was the Nawab’s great fortune that the Lord had chosen to descend and manifest His pastimes in that country. It was only by Mahaprabhu’s mercy that the Nawab was successful and victorious in all his affairs. The Nawab agreed with Rupa Goswami and remarked that he could perceive in his mind as well that Lord Caitanya was none other than his worshipable God (raja kahe shuna, mora mane yei laya, sakshat iswara ihan nahika samsaya). Sri Rupa and Sanatana then began considering how they could meet Lord Caitanya incognito. Thus in the dead of night, the two brothers went to meet the Lord. First, they met Nityananda Prabhu and Haridasa Thakura, who introduced them to Sri Gaurahari. Out of great humility, the two brothers held straw between their teeth and felt down like a rod before Mahaprabhu. They were so overwhelmed that they began crying in joy. They introduced themselves as the lowest of men who were employed in the worst kind of employment. They glorified the Lord as ‘patita pavana’, the deliverer of the fallen, and assured Him that none in the world qualified as being more fallen than them. Out of sheer humility, they declared themselves millions of times more fallen than even Jagai and Madhai, the sinful brothers whom Lord Caitanya had previously delivered (jagai madhai haite koti koti guna, adhama patita paapi ami dui jana). Thus they tried to establish themselves as the befitting candidates upon whom Lord Caitanya should shower His causeless mercy. Hearing their prayers Lord Caitanya became very pleased and blessed them whole-heartedly. He then revealed that the two brothers were His eternal servants. Mahaprabhu also informed them that He had received several of their letters which reflected their humble state of mind and consciousness. He accepted them and awarded them the names Rupa (unto Dabir Khaas) and Sanatana (unto Sakara Mallick). The Lord also revealed that He had come to Ramkeli only to meet and bless the two of them. He reassured them of His protection and asked them not to worry. 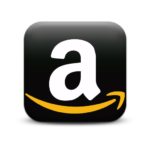 He added that they would be delivered very soon. The two brothers then sought the blessings of all the Vaishnavas present. Before leaving, however, they humbly cautioned the Lord that although the Nawab was favorable at that moment, his mood was unpredictable. By nature, the Nawab was a very dangerous and a violent man. Hence they suggested that it would be better if Mahaprabhu departed from that place without further delay. They also added it would not be very appropriate for Mahaprabhu to travel to Vrindavana accompanying such thousands of followers. Instead, it would be more befitting if Mahaprabhu went alone accompanied by a select few. Having spoken thus, the two brothers offered prayers unto the lotus feet of the Lord and returned to their homes. Although Sri Caitanya was the Supreme Lord Himself, yet He acted like a mere human, in order to teach us neophytes how to react in such situations. Heeding the advice of Rupa and Sanatana, He desired to leave that village. In the morning He left for a place called Kanai Natshala where He relished many pastimes of Lord Krishna. Then thinking about the words of Sanatana, Mahaprabhu concluded that it would indeed not be proper to travel to Vrindavana with so many followers as it might disturb the atmosphere of the dham. Thus He decided to return to Jagannath Puri. 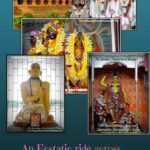 On returning to Puri, the Lord disclosed to His intimate associates how He had bestowed His most intimate mercy upon Rupa and Sanatana owing to their humility and pure devotional qualities. Rupa Goswami took all his treasures and loaded them into boats. He and his younger brother, Anupama, left for their ancestral home at Fatehabad, where they distributed all their wealth. He appointed a brahmana to perform auspicious ceremonies so that they might obtain the shelter of Mahaprabhu. Of his wealth, he gave fifty percent charity to the brahmanas and Vaishnavas, and twenty-five percent to his relatives. Srila Prabhupada highly glorifies and hails this as a perfect example of how one should divide his money and retire from one’s household life. He also deposited ten thousand gold coins with a grocer, in order to help Sanatana Goswami escape from Bengal. Sri Rupa Goswami kept one-fourth of his wealth aside with a respectable brahmana, for his personal safety and emergencies. Srila Rupa Goswami then sent out two men to find out when Mahaprabhu would be leaving for Vrindavana from Jagannatha Puri. The men came back with the news that Lord Caitanya had already left. Sri Rupa immediately wrote a letter to Sanatana Goswami informing him of the news. He also added that he and Anupama were leaving immediately for Vrindavana, and asked Sanatana Goswami to set off as well. He also informed his elder brother that he had left ten thousand gold coins with a grocer, to help him escape. Meanwhile, Sanatana Goswami stopped going to the office and would just remain at home reading and chanting Srimad Bhagavatam all day, in the assembly of devotees. Nawab Hussain Shah came to his residence to inquire about Sanatana’s health, as he thought he was sick. Seeing that he was perfectly fit, the Nawab asked Sanatana to assist him in attacking the province of Orissa. Sanatana Goswami refused to obey the orders of the king and expressed his desire to retire from service instead. The King became enraged and ordered Sanatana’s arrest. 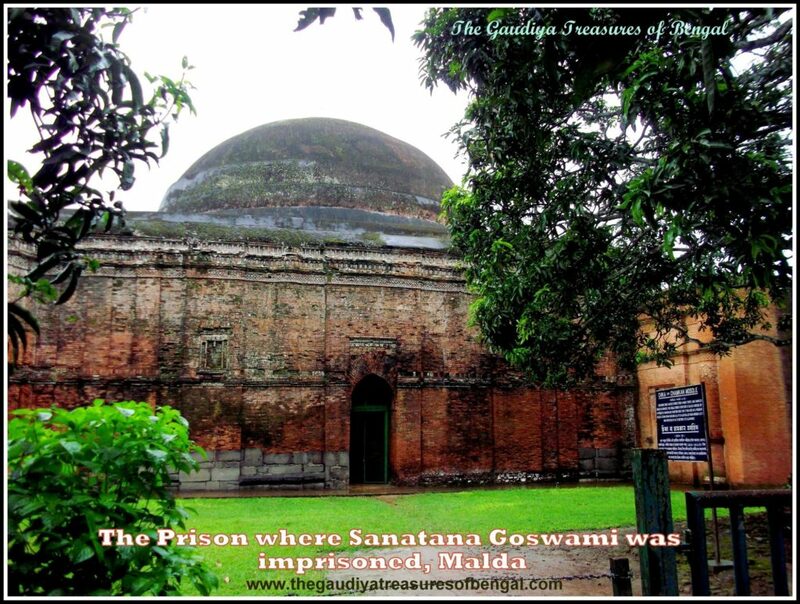 ‘the Gaudiya treasures of Bengal’ considers itself exceedingly fortunate to have been able to visit the jail in which Sri Sanatana Goswami was once imprisoned. Using the money that Rupa Goswami had kept for him, Sanatana Goswami managed to bribe the jailor and somehow escape. The jailor was initially reluctant to release him, but seven thousand gold coins were enough to change his decision. On being released, Sanatana immediately crossed over the Ganges and fled. He passed through hilly terrains and spent the night at a small hotel on his way to Benares. The hotel owner, knowing that Sanatana’s servant Ishana had eight gold coins in his possession, wanted to murder both of them and take away the money. 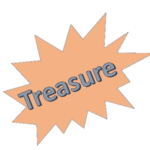 Sanatana Goswami, however, could guess the evil plans of the hotel owner, and voluntarily offered him the coins and sought his help to safely reach his destination. Thus the owner helped them cross the hilly tract and proceed toward Varanasi (Benares). The two brothers Rupa and Anupama, meanwhile, met up with Sri Caitanya Mahaprabhu at Prayag (Allahabad). The two of them held straws between their teeth and surrendered themselves at His lotus feet. Lord Caitanya embraced the two brothers and placed His feet upon their heads. It was here at Prayag at the Dasaswamedha ghata that Lord Caitanya had instructed Sri Rupa Goswami for ten days, empowering him in the philosophy of devotional service. He taught Rupa the limit of Krishna tattva, Bhakti tattva, the truth regarding the transcendental mellows, culminating in conjugal love between Radha and Krishna (Krishnatattva bhaktitattva rasatattva pranta). He also taught him the ultimate conclusions of Srimad Bhagavatam. By entering into Rupa’s heart, Mahaprabhu empowered him to ascertain properly the conclusions of all truths. Teaching him thus, Lord Caitanya sent Rupa Goswami to Vrindavana instructing him to excavate the holy places of Krishna’s pastimes, discover the ancient deities that lied hidden in Vrindavana and reinstall them in his temples, write transcendental pieces of literature and preach the Vrindavana way of worship to the entire world. 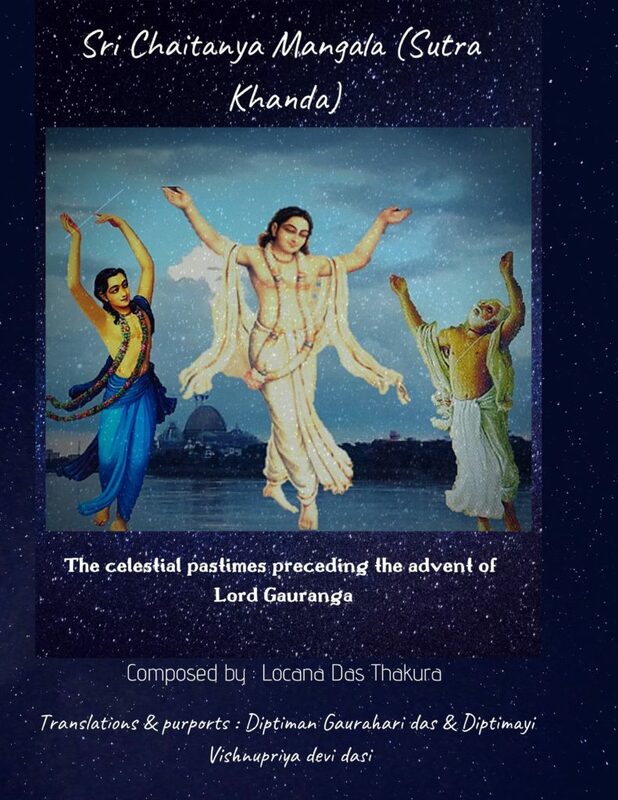 The summary of Lord Caitanya’s teachings to Rupa Goswami has been summarized in one of Prabhupada’s books entitled ‘Teachings of Lord Caitanya’. When Mahaprabhu arrived at Kasi (Benaras), He met Sanatana Goswami over there. The Lord embraced Sanatana and was overwhelmed with ecstatic love. The Lord glorified him greatly and exclaimed that saints of his caliber are themselves the places of pilgrimage. Thereafter for two months, the Lord instructed Sanatana Goswami in various esoteric subjects. The twentieth chapter of the Madhya Lila talks in detail about Mahaprabhu’s teachings to Sanatana Goswami. Thereafter Mahaprabhu instructed him to go to Vrindavana, write books and preach the cult of bhakti. It is said that Lord Caitanya had taught the four principle qualities of a Vaishnava through four of His intimate associates. 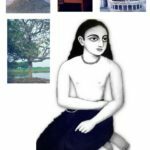 He had taught the quality of self-control through the life and examples of Ramananda Raya, the quality of Neutrality through Damodara Pandita who even scolded Mahaprabhu at times, the aspect of tolerance through Haridasa Thakura (refer – ‘Sri Haridasa thakura’s Bhajana Kutira, Phulia’), and the quality of humility through Sanatana Goswami. 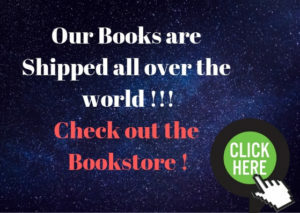 Among the books that Sri Sanatana Goswami had written, Hari Bhakti vilasa and Brihad Vaishnava tosani (commentary on Srimad Bhagavatam) are significant. Amongst the books composed by Srila Rupa Goswami – Hamsaduta, Uddhava-sandesha, Krishna-janma-tithi-vidhi, and Radha krishna Ganoddesha Dipika, Stavamala ,Vidagdha-madhava, Lalita-madhava, Dana-keli kaumudi, Bhakti-Rasamrta-sindhu ,Ujjwala-nīlamani ,akhyata candrika, Mathura Mahima, Padyavalī, Nataka-candrika and Laghu-bhagavatamrta are the most significant. Bhakti rasamrta Sindhu contains the essence of all the revealed scriptures. Sri Srinivasa Acharya is his prayers unto the six goswamis hence glorifies them as experts in extracting the essence of all the revealed scriptures with the aim of establishing the jiva (living entity) in his eternal position of performing pure devotional service unto Krishna (nana shastra vicaranaika nipunau sad dharma samsthapakau). Both Rupa and Sanatana traveled extensively through Vraja mandala discovering many pastime places of Radha-Madhava. Having no fixed residence, they would catch a few winks of sleep (no more than one and a half hours per day) under a tree or bush. They used to live by whatever little they obtained by performing Madhukari (begging from door to door). Sri Rupa and Sri Sanatana spent all their time writing, discussing Krishna’s pastimes, and chanting Krishna’s Holy Names. 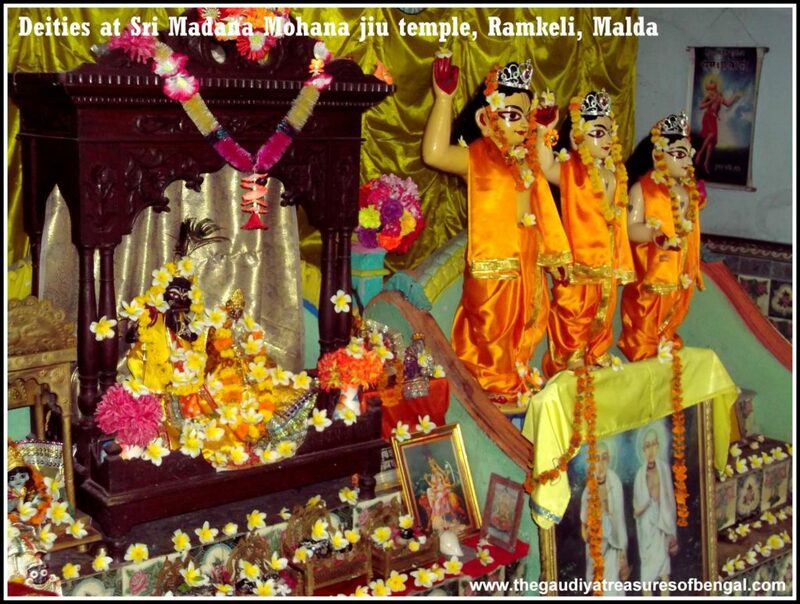 Sri Rupa Goswami established the worship of Sri Radha Govinda Dev jiu in Vrindavana while Sri Sanatana inaugurated the worship of Sri Madana Mohana jiu. Both of these enchanting deities are currently being worshipped at Rajasthan. These two deities along with Radha Gopinath (discovered later by Madhu Pandita) form the three principal worshipable deities of the Gaudiya Vaishnavas. The Gaudiya Vaishnava devotees identify themselves as Rupanugas or belonging to the disciplic succession emanating from Sri Rupa Goswami. The Keli kadamba tree, under which Sri Caitanya Mahaprabhu met Rupa and Sanatana at night (1515 AD) .The local devotees informed us that this sacred tree is hollow from inside. It is only a miracle that it continues surviving. A small temple built under this tree, enshrines Sri Gaurahari’s lotus footprints on stone. Rupasagara, a large pond excavated by Sri Rupa Gosvami. There are eight sacred ponds surrounding the temple. 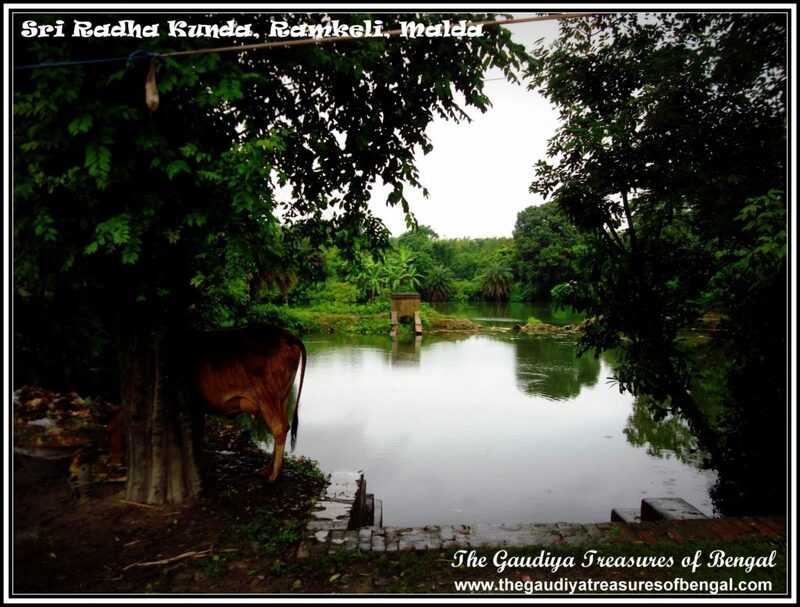 These ponds (Kunda) ,dedicated to the eight principal Gopis of Vrindavana, were dug by Sri Rupa and Sanatana themselves, when they lived here. 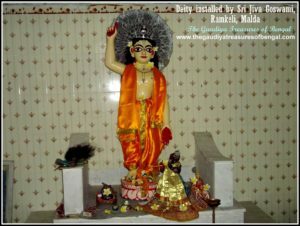 Just outside the temple gates is a beautiful deity of Lord Caitanya that had been installed over here by Sri Jiva Goswami (son of Anupama Mallick). The dancing hall surrounding this temple has been renovated and restored to its health with the help of the ‘Bhaktivedanta Swami Charity Trust’. The prison house where Sri Sanatana Goswami was once imprisoned by Nawab Hussain Shah. Firoz Minar, whose construction was engineered by Sanatana Goswami. We worship the lotus feet of our spiritual master ,whose causeless mercy has empowered us ineligible fools ,to gain entrance and take up service in this exalted abode of Malda (Gaur). We seek shelter of this holy land, and pray that its glories remain forever imprinted in our heart.‘The Gaudiya Treasures of Bengal’ offers millions of obeisances and humbly prays to Sri Rupa and Sanatana Goswami that we advance in our Krishna consciousness, develop attachment unto the lotus feet of Lord Gauranga and are able to serve Sri Guru & Vaishnavas, by our honest and sincere efforts. We seek their blessings and compassion , in successfully rendering this humble service of reciting the pastimes and revealing the pastime places of the Supreme Lord and His beloved associates.We shall consider ourselves greatly fortunate and our existence meaningful if Lord Gaurahari and our dear spiritual master are kindly pleased with our endeavours. Malda, situated in Northern Bengal, is well connected to Kolkata via buses and trains. One can board a train from Kolkata and reach Malda (station name – Malda Town) within 5 hours. Arriving at Malda, the temple at Ramkeli is hardly an hour’s drive. The place lies near the border of India and Bangladesh, and hence one might experience traffic jams owing to the big trucks which commute by the same road. 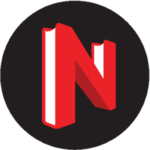 Accommodation – One can choose to stay in any of the prominent hotels of Malda like Hotel Appayan, etc. One can get in touch with the temple authorities of Iskcon Malda (+91 98749 97790 / +91 89673 69069) in order to avail prasadam.